Recent reports from the Wall Street Journal have stated that Google plans to expand its annual Nexus device program to five OEMs, from its previous approach of partnering with a single manufacturer. Google also plans to sell these devices online through the Play Store. Let's take a look at the top five reasons for Google's strategy shift. Google already revealed plans of selling devices through the Play Store, when it began selling the unlocked Galaxy Nexus for $400. 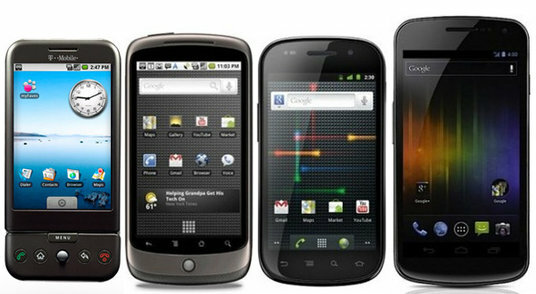 Now, Google plans to expand the Nexus program to five OEMs - Samsung, HTC, Motorola, Sony and Asus. With five Nexus devices, Google would be able to generate greater sales volume and with the stated operating profit margin of 10-15%, it would be a decent amount of incremental revenue. However, since this isn't a core revenue stream for Google, it is unlikely to have been the primary driving force behind this decision, but merely an additional benefit. Reports are conflicted on whether the Nexus smartphones sold through the Play Store would be subsidized or not. WSJ reports that it will be free of carrier restrictions, as the currently available Galaxy Nexus is, but Forbes claims that they will be sold with carrier contracts. Both strategies have their advantages, as a contract-free device gives Google more control over what services & applications are available on a device - for example, Verizon currently does not allow Google Wallet on the Galaxy Nexus in favor of their own payment service. However, selling devices with carrier contracts would create greater sales volume as prices would be lowered thanks to carrier subsidies. Carriers themselves could benefit from a contract-free strategy as it would reduce the subsidy burden from their bottom-line. Based on recent moves carriers have taken against subsidies, it is possible that they may be more open to this approach than they were previously. The only reason I haven't ranked this higher is because I'm not very certain of the power balance here. If Google decides they do not want the Nexus devices on the Play Store to be sold with a carrier contract, do OEMs still have freedom to negotiate independent carrier contracts for Nexus devices? If they don't, this may be more of a risk than a reason for the strategy shift, at least for the smartphone segment. This is a fairly obvious reason. Google has made their plans for the tablet market very clear with their partnership with Asus for the upcoming Nexus tablet. The interesting part is that the Nexus program has not only been expanded to five OEMs, but that the program includes both tablets & smartphones. In effect, we might see more than one major tablet launch from the Android camp this year. The obvious inference here is that these tablets would cover price points from $200-$400 and screen sizes from 7-10 inches. Given that these devices would most likely receive a substantial marketing push as well (depending on the OEM), it makes Apple's decision on the iPad Mini even more important. However, Google's partnership with Asus was already aimed at a major move into the tablet market, and this just highlights Google's commitment to the tablet market. In my opinion, this was one of the major reasons for this strategy shift. It wasn't a coincidence that this report leaked just before China cleared the final hurdle for the Google-Motorola deal to go through. Hardware vendors in the Open Handset Alliance were wary of any preferential treatment Motorola may receive thanks to this deal. With the new Nexus program, hardware partners would have employees working out of Google's Mountain View, Calif. headquarters, in close collaboration with the Android team, which effectively removes any stigma from the Motorola acquisition. This collaboration may also create an additional deterrent against any move by OEMs to fork Android and reduce their motivation to seek other operating system choices. The only reason this hasn't been ranked higher is because I feel like the next reason was paramount in guiding Google's long-term strategy. Driving the pace of hardware commoditization is the single largest factor driving Google's strategy shift. In the long run, hardware is always commoditized and differentiation is driven by software. In the early stages of an industry, hardware carries as much value as software - think of IBM in the early days of the PC market. But as the industry matures, hardware tends to become cheaper and less differentiated. Today, when you buy a PC, how much does a hardware vendor matter? Hardware vendors are usually chosen based on hardware quality, price and after sales service - this is about as close to a definition of commoditization as we can get. The most important purchasing decisions regarding hardware are usually related to product category - For example, different screen sizes & form factors (desktops vs. laptops vs. netbooks in the PC market). Once an industry evolves, hardware vendors put greater emphasis on making sure they cover all product categories. With the expanded Nexus program, Google would have greater control on the user interface elements and customizations on a greater number of devices on the market. Being able to minimize carrier/OEM customizations and applications would make more devices adhere to the stock "Google Experience". An additional benefit would be that Google would be able to push out quicker updates to a larger number of devices on the market and reduce android fragmentation. Conclusion - As we've seen there are many benefits Google can gain from their expanded Nexus program, but the two most important reasons were to reinforce OEM partnerships and to drive commoditization of hardware over the long run. This strategy could also see Google making a greater impact on the tablet market, starting this year. All things considered, the strategy shift looks to be the right move to make at this point in time. Great article, like always! I am very much impressed with your work.. Thanks Mark. I just checked out your website as well, very interesting.